WARREL DANE, legendary vocalist of SANCTUARY and NEVERMORE, will return with his second solo album, currently created under the guidance of renowned producer Roy Z (BRUCE DICKINSON, HALFORD, HELLOWEEN, SEBASTIAN BACH) in 2018. Titled Shadow Work, the album is the follow up to the 2008's Praises To The War Machine, and stylistically strays away from its predecessor, which leaned towards a goth-tinged, less metallic rock sound. First rough mixes already reveal that Shadow Work will offer darker, heavier, more complex songs, occasionally flirting with extreme metal by incorporating such elements as blast beats and combining this with WARREL DANE’s unique, dramatic trademark vocals. 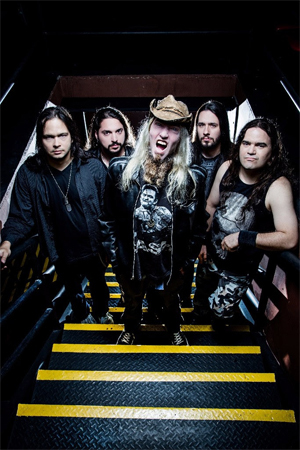 As with the previous WARREL DANE solo tours, including the 15th anniversary tour celebrating NEVERMORE’s classic, Dead Heart In A Dead World, the line-up for the record will consist of Johnny Moraes (guitars), Thiago Oliveira (guitars), Fabio Carito (bass) and Marcus Dotta (drums), who all have been playing with the Dane since 2014. Shadow Work will be recorded during Autumn 2017 and is expected to be released in the first half of 2018 via CENTURY MEDIA RECORDS worldwide.